Photos are available in the Togo 2010 Photo Album. You can view them by clicking the link above. Received from Gary Comerford after his London marathon run. "As promised here is my London Marathon Post Race report. I want to thank everyone who has supported this run by donating to Sleeping Children Around the World. If you have not as yet contributed, there is still time to go on line [at this link] and contribute or just send me a big cheque." Who would have ever thought that getting to a Marathon could be more difficult than the marathon itself; Volcanic ash, cancelled flights, respiratory concerns, airplane safety, and getting there only to have it cancelled were a reality five days before the big race. Through the terrific work of Eileen and a great travel agent, they managed to get me on a flight to Europe on Tuesday evening. A stopover in Paris and Amsterdam to do a little business and I was ready for my last marathon. Listening to the weather forecast on the telly made me think I was in Mumbai, they predicted a high of 22 C. Now 10-15 is fine but 22 is a bloody heat wave for London in April. Need to hydrate! On the bus we go to Greenwich for the start of the race. There were hot air balloons, helicopters, huge TV screens, fabulous music and more port-a-pot ties than I've ever seen in my entire life. There were Virgins everywhere! I mean Virgin signs, including Sir Richard Branson himself, as Virgin was the lead sponsor. The corrals were set up and marked better than I've ever seen. This was one very well organized race. But 30 min. from the start the clouds opened up and it just poured! Glad I remembered the Glad garbage bags. The gun went off, I think. I was so far back I needed binoculars to see the Kenyans. Off went 37,000 runners and one of the largest marathons in the world had begun. As is normal, the first couple of hundred meters were slow, in fact very slow and the sun began to burst through the clouds. The temperature began to rise, and I quickly discarded my throw away top. This was going to be a hot day. You could see the steam rising from the road. Normally I run about a 5:15 per k pace early in a Marathon but I was averaging 6:10 for the first 5 k. I wasn't re qualifying for Boston in this race. In fact it was going to be my slowest marathon ever as well as the marathon where I had the most fun. The crowds were unbelievable right from the start. All through Greenwich people were cheering us on. At one point we passed the Greenwich clock and went from running in the eastern hemisphere to the western hemisphere. Early on I caught up to a group that called themselves the “human caterpillar”. There were 33 runners joined together all decked out in green outfits and the two lead runners wore red hats. At the very front there was this goofy guy wearing Butterfly wings. This was really neat to see. I ran with them for about a thousand meters, and chatted them up. Later in the day I found out that the goofy butterfly was Richard Branson. Two of his kids and Princess Beatrice, Fergie and Andrew's daughter, were part of the caterpillar chain. At 20 k we crossed Tower Bridge and headed towards Canary Wharf. The crowds continued to be deafening. I know I'm running slow as my half marathon time is 2:12. At 22 k I see runners at the 35 k mark on the other side of the road heading for home and they look a lot stronger than I feel. As we run into Canary Wharf I say to myself” there won't be much crowd support here”. Boy was I wrong. The sound of the crowd was again deafening. Thousands were cheering, dancing, waving, and offering you a pint. The Caribbean dancers at 30 k were stunning and helped to really motivate the male runners. I was actually feeling strong, but that's probably because I was running so slow. At 35 k, I usually hit the wall. At Boston after heartbreak hill it was ugly. But in London, I just kept running like the “Eveready” battery. The slow steady approach is actually quite enjoyable. At 40 k you can see Big Ben and it's a welcome sight. A hard right after Westminster and there is St. James Park and Buckingham Palace just 800 m ahead. Around the bend and onto The Mall for a strong finish. Final time 4:40:18. My tenth and final Marathon done. The last of the Five Great Marathons of the world completed. Going forward my annual run will be a half marathon, which Cathy says will be less stressful on the family. Finally a very big thank you to everyone that has, or is planning to support "Gary's Run" for sleeping Children Around the World again this year. Your annual contribution makes a big difference to so many kids in India. 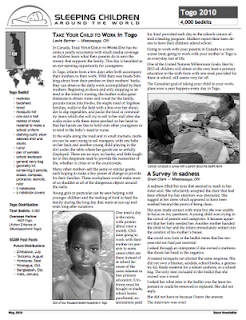 From time to time we see where people in various organizations go on missions to aid those in developing countries. Usually developing means that they are desperate and in need of aid. Canada has a good habit of responding to these issues and has put up tens of millions of dollars to help with the earthquake that ravaged Haiti. There were concerts, fund drives and dinners all to support the Haiti relief campaign. Charitable organizations alone in Canada raised over $150 million. The Canadian government matched donations. That was good in this instance, but soon it is forgotten and we as individuals get back to our normal concerns, like taxes, insurance, gas prices, hydro blackouts and even who is going to win the Stanley Cup. And yet, some who go into the fields of developing countries return to Canada with a whole new outlook. In the past few months I attended the Amabel Men's Club and on two occasions it had speakers who had gone into developing countries and came back with new appreciation of just how desperate things can be. Dave Hicks representing the club went to Cambodia under the Hope International Development Agency, headquartered in New Westminster, British Columbia. Dave, who was the first president the Amabel club had, was to build a community well for a village in Cambodia. The membership had raised $5,000 for this project and an anonymous donor provided yet another $5,000. The club was aware through Hope International that children were "struggling to survive, drinking water from filthy ditches" that were clearly contaminated and used by any number of animals and fraught with hordes of insects. Among those things that impressed him was this: Those villages without a well were sad and with many infections obvious. Those villages with a well were happy and it showed in pictures taken while Dave Hicks was there. So the club did their well and Dave returned to Canada with a different impression of under developed countries. Then Jack Diverty told about his journey to Nicaragua and the club project for Sleeping Children Around the World. The Amabel executive asked members to each give $35 for a bed kit to provide a mattress, pillow, blanket, mosquito net, clothes, towel, and school supplies, depending where children who need the kits are located. The members of the group gave $2,500 for kits and the club matched this with another $2,500. In Jack's case he (and his wife Jackie) volunteered to go and distributed the kits for the club. Under the rules of Sleeping Children all those involved are doing so for the love of being there. The kits are put together in the country where the children are located, providing work for the locals, elimination of transportation costs and a boost to the local economy. They were in Nicaragua and had 10 days to distribute the kits and as hosts they decided where the kits should go. No family gets more than one kit. 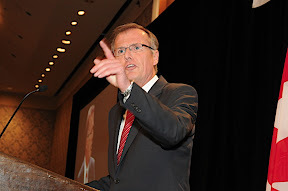 Said Jack, "There is no social security, no OHIP, nothing that we expect and we feel is our right. Their conditions are very bad." And he adds, "You feel like a rock star with these children. I would go back in a heart beat." He saw what goes on for kids in Nicaragua and with these two speakers so did the Amabel Men's Club. Recently there was a television documentary concerning Free the Children, an international initiative where children help children. A person from our world went on a mission and asked a child what they wanted for the village. Her answer was simple. "We are very happy in our village. Thank you and we don't really need anything." Now go out and bounce that question of populations on this side of the economic world. And away we go with our disgruntlements. Taxes, gas prices, bank charges, insurance premiums and on and on it goes. OAKVILLE — After the Pittsburgh Penguins won the Stanley Cup last year, the students at St. Ignatius of Loyola Catholic Secondary School were graced by its mighty presence — thanks to their gym teacher, who also works as a scout for the hockey team. The same inspirational message is carried throughout the Oakville Catholic high school through many of its diverse programs. The school placed sixth among the Top 10 schools in the Halton Region, earning an 8.2 out of 10 in the Fraser Institute report. St. Ignatius scored an 85% average on its academic math results and 56% on its applied, which were both above the board and provincial averages. In Grade 10 literacy results, students scored 97% on tests, above the board average of 92% and provincial average of 85%. In Peter Posocco’s Grade 9 to 12 jazz band class, 33 students are playing Michael Jackson’s Thriller. The hallways of this 27-year-old school are decorated with over 70 murals from visual art students past and present to liven up the atmosphere and show students what they can do when they accomplish their full potential. St. Ignatius is also a school that gives back to the community through its art. Since 2009, the school has raised nearly $2,000 for Sleeping Children Around the World by selling calendars depicting work from visual arts students. They have also sold colouring books with money donated to War Child Canada and Halton Women’s Place. “It makes me feel like I’m giving back to the world — like my art has a further purpose,” Alex Irvine, 18, said. The school is in the midst of a multi-million dollar renovation. In January, a new synthetic turf sports field was built, sporting the Loyola name. Di Ianni said there will be an additional 10 classrooms built near the back and a new cafeteria, new arts wing and new chapel will be finished sometime in 2011 or 2012. 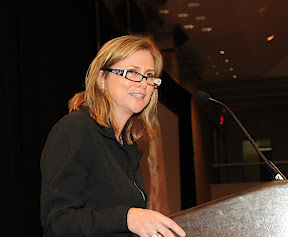 Last Tuesday, more than 600 members of the local business community turned out for breakfast at the Royal York in Toronto to celebrate the 40th anniversary of Sleeping Children Around the World (SCAW), a Canadian international charity dedicated to providing bedkits (bedding, clothing, school supplies and mosquito nets) to children living in underdeveloped countries. Christine Magee, president of Sleep Country Canada, right, and SCAW's chairman and former NHL goaltender Dave Dryden were the speakers at the event, which raised more than $100,000 in support of SCAW's Legacy Fund. The charity was started by Murray and Margaret Dryden, Dave's parents. The interest from the Legacy Fund supports the operating expenses of SCAW, so it can continue to be a 100% charity. Since the charity's inception in 1970, SCAW has raised more than $23-million, providing bedkits to more than one million children in 33 countries. "The man who will forever be the voice of the Tigers is gone, and the baseball community is left silent in remembrance. Hall of Fame broadcaster Ernie Harwell passed away Tuesday at age 92. Harwell spent 42 seasons broadcasting in Detroit ..."
To have grown up a kid in Windsor and having the old man take you to Tiger Stadium on a muggy, July afternoon to catch the Detroit Tigers in action knowing that night your team had a baseball game in a league in Windsor -- real baseball with baseballs, not fat softballs, like the breed played here -- it was baseball Nirvana. Maybe it was the proximity to the U.S. What with it all being Amurrica's national game, but for my brothers and me, Tiger Stadium, the Tigers and Ernie Harwell were like church icons. Even if you weren't at glorious, grungy Tiger Stadium at the corner of Michigan and Trumbull, through Harwell kids in Windsor and Detroit recognized double plays as "two for the price of one," and home runs as "looong gone!" Probably no one has ever coined a phrase like this for a batter who watches a called third strike sail by, his bat still on his shoulder: "He stood there like a house by the side of the road." "Over time, Ernie's voice became the sound-track of our internal pictures, until the game became a story -- a story told by a fatherly figure. I once said if baseball could talk, it would sound like Ernie Harwell -- unhurried, slightly southern, as comfortable as an old couch." They don't make `em like Ernie Harwell, any more. Everyone's talking about "jack city" for homers and trying way too hard to come up with a catch phrase. For Harwell, it just came naturally and there was always something just so Tigers about everything he said into that mic. As a kid in Windsor, when the 'Tigs' took that amazing World Series in 1968 against the Cards -- with guys like Lolich, Mclain and Willie Horton -- we listened to the broadcasts in the afternoon and it was Harwell who brought the magic home to a bunch of kids in Grade 7 through his game-calling mastery. He was one for the ages. Seeing as today's column seems to have veered into Malette's Faves, here's my favourite charity, or certainly one of the top 10. Sleeping Children Around the World (SCAW), a Canadian international charity dedicated to providing bedkits (bedding, clothing, school supplies and mosquito nets) to children living in underdeveloped countries, celebrates its 40th anniversary in 2010. Since its inception in 1970 by Murray and Margaret Dryden, SCAW has raised more than $23 million, providing bedkits to more than one million children in 33 countries. I met Murray Dryden when he gave a presentation at Bridge Street United Church some years ago. I was immediately impressed with the top-to-bottom volunteer nature of SCAW and the fact every nickel actually goes to the kids it purports to help. Murray Dryden was a prince of a man and his charity struck a chord with me, having seen children sleeping in dirt and squalor in places like Somalia, Haiti, Honduras and post-war Bosnia. For every $35 bedkit donation, 100 per cent reaches a needy child. To personalize the donation, a photo of the child with their bedkit is sent to the donor. Take it from me, this is a good, honest charity. For more information on SCAW, visit www.scaw.org. The FAN 590's Rob Wong speaks with former NHL goalie and chairman of Sleeping Children Around the World, Dave Dryden. Dryden talks about the charity which provides bed kits to children in underdeveloped and developing countries. Sleeping Children Around the World (SCAW), a Canadian international charity dedicated to providing bedkits (bedding, clothing, school supplies and mosquito nets) to children living in underdeveloped countries, celebrates its 40th anniversary in 2010. Since its inception in 1970 by Murray and Margaret Dryden, parents of NHL hockey legends Ken and Dave Dryden, SCAW has raised more than $23 million, providing bedkits to more than one million children in 33 countries. An event was held today at the Fairmont Royal York Hotel in Toronto with the local business community to honour SCAW’s 40th anniversary. More than 600 people gathered this morning to hear Dave Dryden, Chairman of SCAW, Christine Magee, President and co-founder of Sleep Country Canada, amongst others, express what the Charity means to them and how it has helped more than one million children around the world. For every $35 bedkit donation, 100 per cent reaches a needy child. To personalize the donation, a photo of the child with their bedkit is sent to the donor, providing a timeless way for the donor to remember the child who benefited from their generosity. Bedkits are given to needy children in developing countries to help them face the challenges of the coming day. The content of a bedkit differs depending on the country. Common items include: mattress, ground mat, pillow, bed sheets, mosquito net, shorts/t-shirt or dress, wool blanket, sandals, towel, and school supplies. The vision for SCAW began during Murray Dryden’s travels to India. One night, while traveling through the country, Murray tripped over a child sleeping on the street and decided that he was going to do everything in his power to ensure these children had a bearable place to sleep and were better prepared to face the challenges of the coming day. He couldn’t feed the world, or alleviate hunger, but he believed a good night’s sleep could make a hungry child’s life more comfortable. Murray and Margaret Dryden registered this charity in 1970 with a distribution of 50 bedkits in Pune, India. Murray and Margaret devoted their retirement lives to this program, initially hoping to raise $1 million. After this was achieved, Murray set a new goal of one million bedkits. In 2009, SCAW reached this goal by delivering their one millionth bedkit to a child in Kenya. 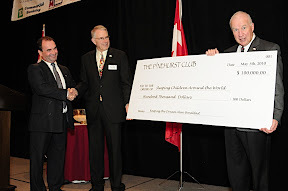 The Second Annual Pinehurst Club Breakfast took place at 7:30 a.m. this morning (May 5, 2010) at Toronto’s Fairmont Royal York Hotel to celebrate SCAW’s 40th year as a 100 per cent charity. Christine Magee, President and co-founder of Sleep Country Canada and Gary Comerford, Executive Vice President and Chief Marketing Officer for RGA International Corporation were the featured guest speakers. SCAW’s Chairman, Dave Dryden, spoke as well in front of the local business community. The breakfast supported SCAW’s Legacy Fund, which was initiated by its founders, Murray and Margaret Dryden. The interest from The Legacy Fund supports the operating expenses of SCAW so it can continue to be a 100 per cent charity. In the last few years, a study completed by Financial Experts indicated that the Legacy Fund will need to be strengthened in the future if SCAW expects to keep increasing the number of bedkits given to children. Supporters of SCAW initiated “The Pinehurst Club” to help grow the Legacy Fund and to keep the dream alive. Last year, the inaugural event, featuring Michael “Pinball” Clemons, CEO, Toronto Argonauts football team, raised more than $90,000. This year the charity hopes to surpass this amount. Sleeping Children Around the World (SCAW) is a Canadian international non-for-profit organization dedicated to providing bedkits to children of any race and/or religion living in underdeveloped and developing countries. Over the past 40 years SCAW has given out bedkits in 33 countries including India, Panama, Thailand, Bangladesh, Indonesia, Peru, Tanzania, Colombia, Philippines, Togo, Kenya, Uganda, Ethiopia, Rwanda, Vietnam, Malawi and Sri Lanka. For more information on SCAW, please visit www.scaw.org. A charity that helps to provide children''s beds and mattresses for kids around the world is celebrating 40 years of success. Based in Canada, Sleeping Children Around the World (SCAW) was established in 1970 by Murray and Margaret Dryden, who aimed to give children in developing countries the means to get a good night''s bed rest. Since it was launched, the charity has raised more than $23 million (£14.9 million) to provide bed kits for over a million children in 33 countries. 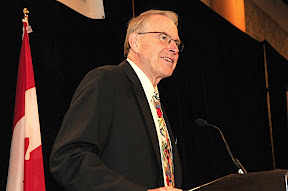 "Everyday SCAW works towards fulfilling [my father''s] dream of a world in which every child benefits from the comfort of a good night''s sleep," commented SCAW chairman Dave Dryden at a celebratory event in Toronto. Throughout the course of this year, SCAW will distribute beds and mattresses to children in the Philippines, Togo, Uganda, Zimbabwe, Tanzania and Bangladesh. Last year, the charity marked another milestone - the distribution of its millionth bedkit to a child in Kenya.